Are you looking for a family law attorney in Morris County, NJ? Kathy Karas-Pasciucco of Feitlin, Youngman, Karas & Gerson has been a family law attorney in Morris County, NJ for years. Family law refers to the area of law dealing with family and domestic matters, including but not limited to marriage and domestic partnerships, child custody and parenting time, neglect, domestic violence, divorce, property settlement, alimony, and child support. The breakup of a marriage or difficult familial matters entail complex emotional, financial and legal considerations, unique to each family. With so much at stake, it is critical for us to take a holistic view of our client's situation, to ensure that the outcome secures not just the best financial resolution possible - but an outcome that enables family members (most importantly children) to move on with their lives with minimal turmoil and distress. We have handled many family law cases for our clients. We know that every family's circumstances are different. The legal and interpersonal dynamics of each situation need to be carefully assessed to determine the best possible legal strategy. Different types of divorce, child custody, and aspects of family law can be overwhelming. When a family is engaged in family law issues, it is important that they understand the types of settlements available to secure an agreement that provides the family with the closure necessary to move forward. We focus on assisting in negotiating with your spouse or family member to reach settlement terms in a non-adversarial way. We have additional training in mediation to help minimize the legal wrangling and acrimony so you can work towards a compromise. Family law often deals with complex issues that are best dealt with by both parties in a collaborative setting. When applicable, we seek peaceful ways to resolve the issues between the parties. Unfortunately this is not always an available strategy. If your case is contentious, we are experienced litigators and are able to advocate on your behalf to work towards the results you are seeking. 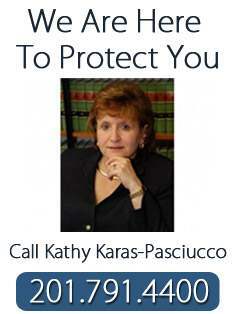 For more information about our family law attorney in Morris County, NJ, call Kathy Karas-Pasciucco at 201-791-4400.